Wow, it’s been a month since my last post! 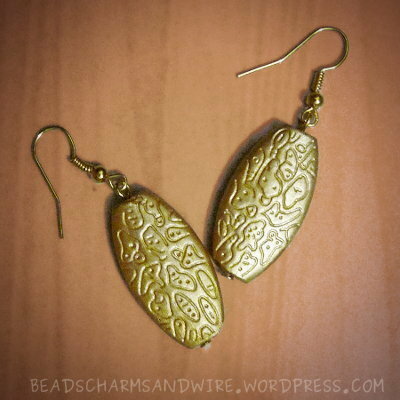 I’ve not been making much jewelry these days, so the pause in my jewelry blogging is inevitable. 🙂 I’ve mostly been working on one or two personal programming projects, and on my knitting. One piece of jewelry I did make recently was a paper button for a short jacket that I knit for my sis. The jacket is light-and-dark gray, and I wanted to make a button that matches those tones. I decided to make a spiral disc bead, and add some wirework in the end, both as embellishment and as the loop through which I can thread the ‘button’ onto the jacket. I made the bead by winding many thin, long, slowly-tapering strips of newspaper one after another. This way, the bead ends up wider than it is long. Of course, plenty of glue is needed from time to time to prevent unwinding of this ‘super-long strip.’ After the glue dried, I painted the bead with a rough ombré effect of black and silver acrylic colors in the front, and fully black at the back. I waited for the paint to dry fully before applying multiple coatings of mod podge, letting the piece air-dry between coatings. The finished bead is pretty sturdy, and is about 0.5cm thick and 2cm wide. Yay, paper beads are back in my jewelry-making! I spent some time recently making paper beads. I used some junk-mail paper for these. I didn’t really have any sizes in mind, I just wanted to make two sets of beads — one set smaller than the other. I cut rectangles from the paper, 4 of the same dimensions, and 2 of smaller dimensions. I folded each rectangle diagonally and cut it along the diagonal, giving me 8 large and 4 small right-angled triangles. I rolled them up into simple tapered beads, applying glue at regular intervals to keep the rolls snug. When the bead bases were made, I painted gradients of acrylic colors onto them. Mod podge followed when the paint dried. The beads were now ready! 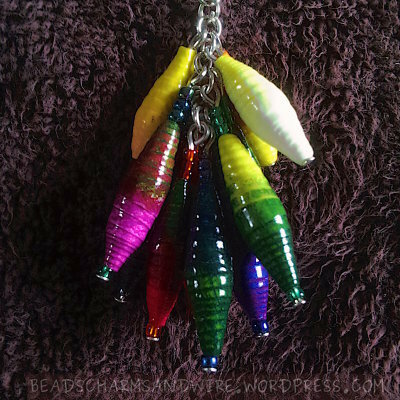 I then strung these paper beads and various seed beads through head pins, making eye loops at the top of the headpins. These formed individual units of the bead-bunch. Finally, for the trunk of the bunch that extends into a chain, I joined small jump rings. While I was adding each link, I also added the bead-bunch units, larger ones at the beginning / bottom. That went — open jump ring, insert it into the topmost jump ring of the chain-in-progress, insert bead-bunch unit #1 from one end of the open jump ring, insert bead-bunch unit #2 from the other end of the open jump ring, close jump ring, repeat. This time, I was more careful while working with the wire, and here are the resulting beauties!